South African PowerBall has two draws a week taking place on Tuesdays and Fridays in Cape Town at just after 9pm local time. You can bet on the outcome of this draw and win the same prizes at Lottoland. How does playing South African PowerBall at Lottoland work? Instead of entering the official South African PowerBall lottery draw, you place a bet on the outcome. You pick the numbers you think will be drawn in the same way as if you had entered the official lottery draw. Betting with us, you win the amount that you would have won if the official prize fund was shared between you and any official lottery winners. The results of the draw can be found here. How do I choose a line? Just select 5 numbers from 1 to 50 and a “PowerBall” from 1 to 20. Once you have chosen your numbers, select which draw you want to bet on, either Tuesday or Friday, and press ‘Submit’. This will take you through to a checkout – at this stage just click ‘Confirm and proceed’ to place your bet. How do I win the Jackpot? You will win our jackpot if your 5 main numbers and PowerBall number match those in the official South African PowerBall draw. Can I win all the same prizes playing with Lottoland? Betting with us, you win the amount that you would have won if the official prize fund was shared between you and any official lottery winners. You can also go for twice the jackpot by selecting the DoubleJackpot option. See below for information on how this feature works. How does the DoubleJackpot feature work? The DoubleJackpot feature allows you to bet for twice the official lottery jackpot. So, for instance, if the official South African PowerBall draw is €1m and you bet on the outcome with us and activate the DoubleJackpot feature, you will go for a jackpot of €2m. The prizes for all other tiers will remain the same. You will pay double the price of your normal line to activate the DoubleJackpot feature. The South African PowerBall draw takes place on Tuesdays and Fridays in Cape Town at just after 9pm local time. The draw is done using a computerised system that chooses the winning numbers at random. What are the odds of winning the jackpot? The odds of winning the jackpot are 1 in 42,375,200. A breakdown of all the odds for each prize tier is included below. What is the PowerBall Plus? PowerBall Plus is an additional draw which follows on from the main South African PowerBall draw. If you would like to bet on this additional draw, just tick the PowerBall Plus box located directly under the main bet slip. The same numbers you selected in the main game will be used for your bet in this supplementary draw. When you bet on the outcome of South African PowerBall, you win the amount that you would have won if the official prize fund was shared between you and any official lottery winners. The table below explains the different prize tiers and odds of winning each prize tier. Winning amounts for previous draws can be found on the results page. If your account has been verified simply proceed to your account and withdraw your winnings. If your account has not been verified you will first need to provide proof of your ID and proof of address. Once this has been confirmed you will be able to withdraw your winnings. All your winnings are guaranteed to be paid out at Lottoland! All bets are placed on your behalf with EU Lotto Limited, licensed by the Government of Gibraltar and registered with and regulated by the UK Gambling Commission, the Gibraltar Gambling Commission, and the Revenue Commissioners in Ireland. Subscriptions remove the hassle of betting on repeat lines and the fear of missing out on that big jackpot win. Our Subscription feature allows you to set up a running bet or bets on a given lottery draw. The subscription is open ended and will run for as long as you want it too. You can opt out at any time. Why should I play South African PowerBall at Lottoland? PowerBall offers very reasonable odds of winning the top prize and boasts minimum jackpots of at least £1 million. 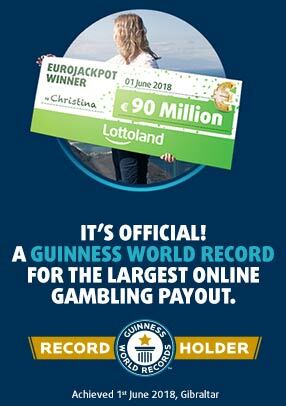 Also, for just €0.35 more, you can bet on an additional jackpot: the PowerBall Plus.